At this time, Freedom ships merchandise to locations within the United States and U.S. territories, including Alaska, Hawaii, Puerto Rico, Guam, and the US Virgin Islands. Freedom No Pull Harness ships to Canada. Freedom does NOT ship merchandise to any other international locations. The risk of loss and title for all merchandise ordered on this Web site passes to you when the merchandise is delivered to the shipping carrier. We deliver via USPS or a comparable delivery service. We use U.S. Postal Service for PO Boxes, APO and FPO addresses. Items ordered at the same time may not always be shipped together. Shipping and Handling charges are not refundable. A 20% re-stocking fee will be applied to all items that are returned and NOT exchanged. If the item is exchanged the re-stocking fee will be waived. The $6.99 shipping fee will be applied to re-ship all exchanges. All orders are shipped US mail with tracking and/or signature required. Shipping time includes processing, packaging, and delivery. Economy orders are free for orders over $34.99 and ONLY $4.99 for orders under $34.99. Economy orders ship 2-4 business days AFTER the order is placed. The order is shipped. US economy arrives approximately 7-10 business days AFTER the order is placed. The order is placed on Saturday the 1st. Expected shipping time frame Monday the 3rd to Thursday the 6th. Approximate delivery time frame Friday the 7th to Monday the 17th. Need your order quick, Priority orders are processed fast and ship within 24-48 business hours. Priority orders are free for orders over $49.99 and ONLY $6.99 for orders under $49.99. Priority orders ship 1-2 business days AFTER the order is placed. The estimated delivery time frame for Priority shipping is 3-5 business days for orders placed before 2pm EST. Orders placed after 2pm EST will be considered received the next business day and processed as such. Please note that Priority mail is NOT guaranteed. If you must have the order by a specific date please select Express mail which is guaranteed within 1-2 business days. Priority shipping is shipped USPS with delivery tracking and confirmation. Expected shipping time frame Monday the 3rd to Tuesday the 4th. Approximate delivery time frame Wednesday the 6th to Saturday the 9th. Need your order super fast, Express is the only shipping that is guaranteed shipping delivery. Express shipping starts at $21.99 and depends on how much “stuff” you are shipping. Orders placed before 3pm EST are guaranteed to arrive within 1-2 business days. The order is placed on Saturday the 1st prior to 3pm EST. Guaranteed shipping time frame Monday the 3rd. Guaranteed arrival Tuesday the 4th to Wednesday the 5th. All Express orders are shipped with signature required. Canadian orders are shipped via US Priority Mail. Orders take approximately 7-14 business days to delivery after the order is shipped. Orders make it to customs within 3-5 business days and can take 3-10 business days to clear customs. Your payment is processed the instant you confirm and submit your order, regardless of whether or not the product is in-stock. If you have a question regarding shipping time frames please contact us via phone or email prior to ordering. Freedom charges sales tax for merchandise ordered on this Web site based on the applicable state sales tax rate and the location to which the order is being shipped. State sales tax is applied to all orders shipped to NY. We strive for 100% customer satisfaction. If you find that your order does not meet your expectations, please contact us PRIOR to sending back any return. We are more than happy to return or exchange any unused item, other than food, within 30 days. Once you have contacted us simply repackage the product(s), including the packing invoice and mail the package back to us with thirty (30) days of your purchase. There's a restocking fee of 20% of the merchandise cost applied to returned items not for exchange. You are responsible for the return freight. And, we are unable to accept returns of food products or chews, customized or personalized items, or any items that have been used/tested/or tried. Please note that putting on item on for sizing adjusting purposes is fine. However, once the product is put into use to test or try it is considered used and can not be returned or exchanged as we do not resell used products. You may try the harness on your dog for fitting, however, once the dog and the harness go for a walk, or if the harness is left in the dog inside the house for any time period beyond trying it on for fitting, the harness is considered used and can no longer be returned or exchanged. A 20% restocking fee will apply to ALL items that are returned and NOT exchanged for a different item. Original shipping charges are NOT refundable. Additional shipping charges will apply to all exchanges unless the exchange is due to an error made by the company. Customers must contact us prior to sending back any item. Free shipping is only applicable to the original orders over $49.99. For exchanges, the customer is responsible for all shipping charges in both directions, you will not receive Free shipping on the exchange. For orders that received FREE shipping. If an item is returned and NOT exchanged a 20% restocking fee, whichever is greater, will be deducted from the return credit. Food Products and/or Chews may NOT be returned or exchanged. Packages being returned/exchanged should be sent either insured and/or with delivery confirmation. A credit/exchange can not be issued to packages lost/damaged in the mail. Please allow 7 to 10 business days for the return to be processed once we receive it. You may select whichever delivery/shipping service you want. Please make sure you keep your tracking. Please read through the shipping information. If you have any questions please Contact Us. No warranty of any kind, implied, express or statutory, including but not limited to the warranties of merchantability and fitness for a particular purpose is given with respect to the Freedom No-Pull Harness except as expressly described herein. 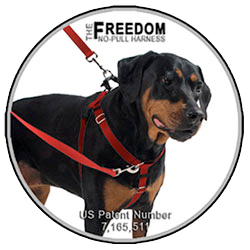 The patented Freedom NO-pull harness features a limited lifetime chewing and structure warranty from the manufacturer. Up to (2) webbing pieces will be replaced for free. The harness is created from industrial strength webbing that can tow cars. The webbing will NOT break unless it was nipped or bitten. Should you see a slice or fray it is because it was bitten. Good news though!!!! The harness can be repaired for free. There is a small charge for return shipping. The manufacturer warranties the structural components of the harnesses for the entire time the original retail purchaser owns the product. Structural components include the metal hardware, webbing, and reinforced structural "x" stitching at junction points. Trim/material wear, chewing, snags, etc. are considered part of normal use and are not covered under the terms of this warranty. Any form of modification to the harness whether it be a repair by an outside source or altering voids the warranty and the repair can not be honored. This warranty does not apply to any failure defects or damage caused by hanger wear, acceptable aging, neglect, chewing, scratching, misuse, interaction with other pets, abuse, modification, unauthorized repair or alteration, washing damage, or causes external to the product such as excessive heat or burning, cutting, or acts of God. This warranty is not transferable in any manner. The exclusive remedy under any express or implied warranties or breach of any obligation shall be repair of the product or replacement shall be at the sole discretion of the manufacturer. All original components must be returned to the manufacturer to receive a repair or replacement of a new product. The shipping cost to the manufacturing facility will be paid by the purchaser. The manufacturer shall not be liable for proximate, incidental, consequential or other damages to property or injuries to persons or animals including recovery of losses resulting from negligence. Although the information on this Web site is accessible worldwide, not all products or services discussed in this Web site are available to all persons or in all geographic locations or jurisdictions. Freedom and the advertisers each reserve the right to limit the provision of their products or services to any person, geographic area, or jurisdiction they so desire and to limit the quantities of any products or services that they provide. Any offer for any product or service made in the materials on this Web site is void where prohibited. GOVERNING LAW: In the event of litigation both parties agree that the Law of the State of business registration of Freedom shall apply and both parties shall consent to the jurisdiction of said State's courts, or in the event of diversity of citizenship, the United States District Court for the (District). Both parties expressly waive a trial by jury. MISCELLANEOUS: The Terms and Conditions constitute the entire agreement between you and Freedom with respect to this Web site. The Terms and Conditions supercede all prior or contemporaneous communications and proposals, whether electronic, oral or written between you and Freedom with respect to this Web site. No modification of the Terms and Conditions shall be effective unless it is authorized by Freedom. If any provision of the Terms and Conditions is found to be contrary to law, then such provision(s) shall be constructed in a manner to closely reflect, as much as possible, the intentions of the parties, with the other provisions remaining in full force and effect. Copyright © 2012-2016 Freedom. All rights reserved. As a user, you are authorized only to view, copy, print, and distribute documents on this Web site so long as (1) the document is used for informational purposes only, and (2) any copy of the document (or portion thereof) includes the following copyright notice: Copyright © 2012-2016 Freedom. All rights reserved.